manila fashion observer: Vote for Berry!!! I told myself I will never be a stage mother, but wow, now I understand. Once the baby comes, it's like a light switch flips on! Annabelle Rama isdatchu? Well, hindi naman ganon. See, Berry is a finalist in googoo&gaga's Koooky Kid Contest, and of course, we are in it to win it! Friends and family pride ya know! So dear readers, since we are family, friends, online friends and practically family, if you have a Facebook account, please become a fan of googoo&gaga and Vote for Berry ---> click HERE NOW! Just "like" her photo, that's a vote! We've only got until December 16 Manila time! All the babies and kids are cute, but please, let's try not to be salawahan ok? Try lang! If possible, Berry all the way! Heehee! Oh, and Berry would like to say thanks to Tita Cecile for the shoutouts! Now Berry has stylist Michael Salientes's seal of approval. Thanks also to friends (thanks Tita Crix for the blog post!) and family who voted and helped spread the word! (Psst, Parokya ni Edgar fans, your idol Chito voted for Berry na!) But still, we still need all your help! 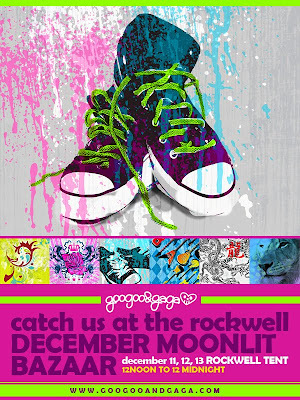 Incidentally, googoo&gaga will be at the Rockwell Moonlit Bazaar this weekend, Dec. 11-13, from 12 noon to 12 midnight. Their booth will be located outside, on the right side of the Rockwell tent (by the EXIT, near the huge Christmas tree)! They have new styles and reprints available! Check them out! And put in a good word for Berry, heehee! Hi Tin! I became a fan of Googoo&Gaga just to be able to vote for Berry. Here's the funny thing, my friends started asking me if I'm having another baby when they saw their FB homepage. Hahaha! No can do, I'm too old to have another baby. go berry! the other babies are all adorable and it's hard not to vote for them, too. it's bad to have this competition coz they should all win! 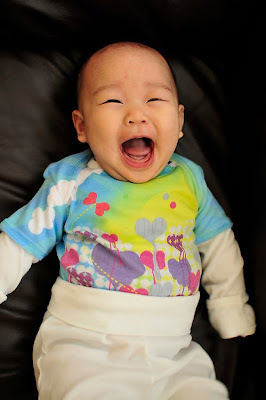 BUT i have to admit, berry's photo is perfect coz her photo shows a kooky baby all googoo&gaga! berry is the epitome of a googoo&gaga baby!! !